We’ve worked with film director Martha Fiennes for years – providing projection for her art film Nativity, which uses AI technology. Traditional film making techniques are combined with AI technology resulting in a film that shows a different narrative every time its shown. Now she’s done it again with her new film Yugen starring Hollywood actress Salma Hayek. The film takes its name from a Japanese understanding of cosmology and through the use of technology sees her appearing to manoeuvre through space and time. Hayek was filmed acting in front of a green screen, which was then layered into a specially adapted gaming computer. The AI then randomly layers up each element, to produce a move with no predetermined start or finish. 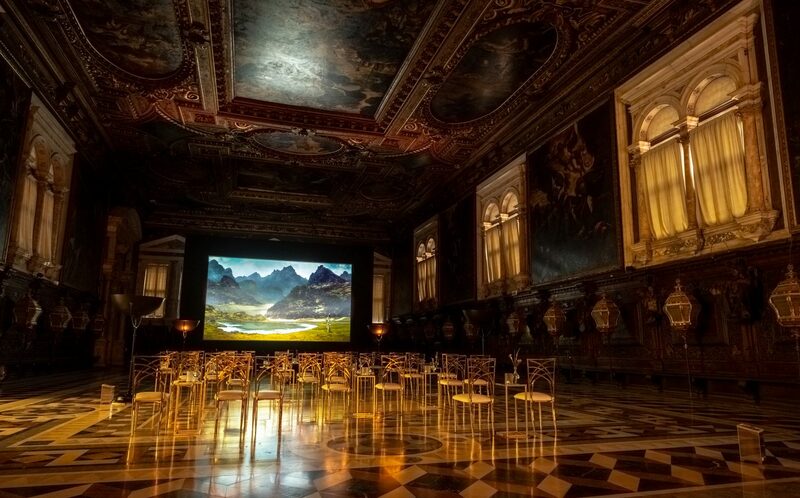 We were last in Venice in 2017 with Fiennes’ exhibiting Nativity for the Venice Biennale. This time we were there on a grander scale working with a local technical production company to create an enormous custom built screen and rear projection to show the film. The venue was the stunning Scuola Grande di San Rocco. Nice work if you can get it!